All of Osei's work is done using a custom process of tattooing called Freehand. 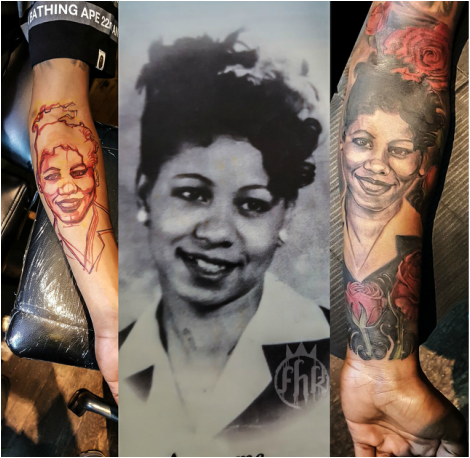 Freehand tattooing involves neither tracing nor copying, and can be done with an initial sketch or for Osei's bolder and more seasoned clients, can be done without drawing all. It is completely intuitive and an exact interpretation of your concept, and ideas from his imagination to your skin. Please enjoy his unique designs and note that they are all completely different from one another because they are not only a reflection of the artists skill but also the unique imagination of his extremely creative clients. Leave plastic covering on tattoo artwork for one hour. Once plastic has been removed gently wipe excess ink from area and rinse the tattoo with a mild fragrance- free antibacterial soap (dove or dial). Do not scrub, scratch, ,soak or submerge your tattoo in any liquid. Once your tattoo has air dried immediately apply your given aftercare product. Apply in a thin layer over the entire tattoo everyday for a period no less than 3 weeks. Do not allow your tattoo to dry out. It is important that hands are sterile before applying moisturizer. Once the tattoo has been moisturized do not cover it, let it air out as often as possible. If it must be covered by clothing make sure to wear loose fitting and breathable fabric for at least 2 weeks. It is extremely important that the tattoo is properly moisturized and exposed to air at all times . Wash once a day and be sure to keep healing tattoos away from pets, pools, beaches, chemicals, soap with fragrance, and most of all sun exposure. In the summertime after tattoo is healed, it is extremely important to apply sunblock when long exposure to the sun is anticipated. Only when healed. Most of all enjoy your new Artwork!